The rare book library at the University of Toronto is open to the public. This past weekend I found myself roaming the spaces inside the rare book library at the University of Toronto and thinking about novelist Rita Mae Brown when she wrote: “When I got my library card, that’s when my life began.” I suspect I could have said the same thing. 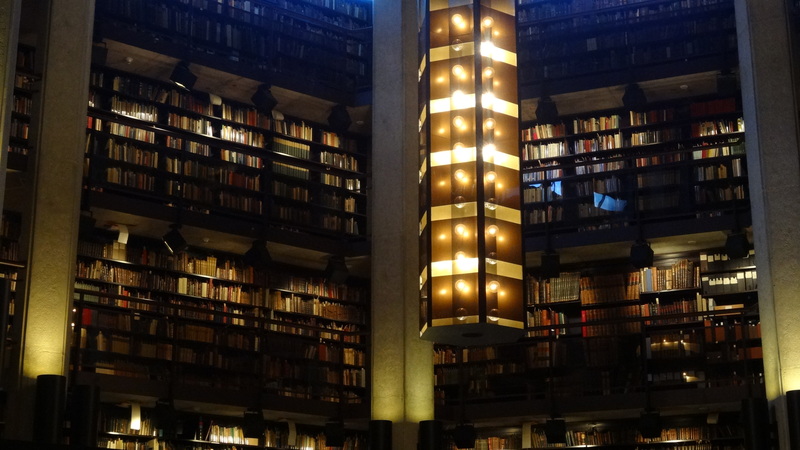 I have always loved a library, and this visit brought back a flood of memories, and reminded me about what a real, book-filled library can mean to writers. When I was 16 years old I started my first part-time job. I was paid 80 cents an hour to work ten hours a week in the local children’s library. A writer and book lover even then, I was elated not only at the extra $8.00 I had to spend (or save if I was feeling virtuous), but most especially because I could spend those hours among the stacks, re-shelving books and helping kids find that perfect read. The next year I started university and got another library job; this one was completely devoted to stacking books among the very many, multi-tiered spaces that constituted the main library at my university. I was still delighted to breathe in that unmistakable smell of books. I loved it until I could no longer afford the time away from my studies and that was that. Years later I found myself toiling as a university professor; again the library became an important refuge for both work and for research. But the end was drawing nigh. Online resources became so much more convenient, saving me both time and effort thus permitting me to accomplish so much more. The digital book became a god-send, although I thought that I’d probably not go that way for my own leisure reading. I was wrong. Today I cannot imagine not carrying my library around with me on a mini-tablet. I cannot imagine not being able to highlight with a click of a finger-tip, or to make a note that will immediately be filed in order. I cannot imagine a student today wanting to lug around heavy books. But none of this means that I like a real, book-filled library with a real, living, breathing librarian any less, nor does it mean that the library is any less important to culture in general and to writers in particular. So what does this real library offer today’s digitally-savvy writer? Here’s what it means to this writer. 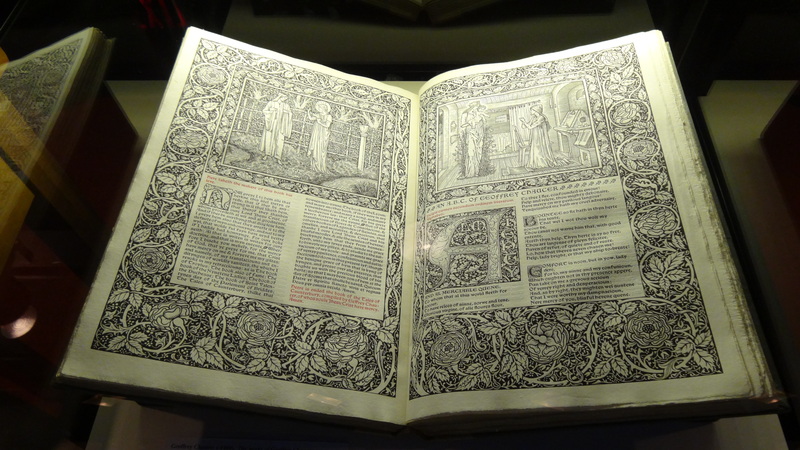 How could you not be inspired by such books as an original Chaucer?? You have to go to a library to find these gems. “I ransack public libraries, and find them full of sunken treasure.” So said Virginia Woolf, and so do I. Libraries are treasure troves of writing ideas. You can go into a library without a single notion of what to write, and come out with a journal full of ideas. Although free roaming can be inspiring, if you have a general area of interest you can go to that section of the library and begin scanning book titles. Or, what’s even more fun, you can randomly select a few books from the stacks, find a comfortable place to curl up with them (libraries are full of these areas) and begin to explore between the covers. “A library is the delivery room for the birth of ideas, a place where history comes to life. “ I like to think that Norman Cousins was echoing my own notion that when you have an idea for a piece of writing, but are not entirely sure how to get it from the beginning germ of an idea to a fully finished piece, you go to the library and allow that idea to gestate and elaborate. I begin by searching for a specific book about the topic area. For example when I started writing about Edgar Allan Poe in In the Shadow of the Raven and I had an idea about the female heroine, I went into the university library and searched for a book about 19th century women. I found a wonderful and very old book that was just the inspiration I needed to get into the character. Then all you have to do is scan the shelves near to your first book to see related but increasingly divergent topics. Just get to know the cataloguing system in the library of your choice. Often public libraries use the Dewey Decimal System, while university libraries use the Library of Congress System. And yes, you can go into a university library to peruse the books even if you can’t take them home. Libraries can be magical places for writers. You can have your coffee shop writing sessions or your marathon computer stints, but I’d recommend trying a library appointment with yourself. Previous When is a bestseller not a bestseller? Love libraries. Love this post. Thank you for reminding me to get off my chair and to go roam. Not surprised that you love a library, D.! Libraries can enrich our lives if only we take the time to look. So true! Thanks for stopping by! P.